Ever wondered how we go about creating so many beautiful colourways here at Bill Baber Knitwear? Well, we thought we would take you behind the scenes at the Studio and show you how its done. Three or four times a year we pack up our finest styles and strongest colours and travel off to a Tradeshow. If you have been keeping an eye on our social media over the years, you’ll have seen Bill, Helen & Jack at various locations meeting businesses and buyers from all over the world. For these Tradeshows we produce not only examples of the styles that we can knit, but also the colourways we can knit them in. Usually we have around 15 – 20 colour options for each style we produce. When you consider there may be 50 or more styles, made in as many as eight different material types and then in 15 -20 different colours, the choice is huge! Which is great as each business we supply can curate their own collection of unique styles and combinations. So, how do we produce these colourways? First, you need some supplies! We use hundreds of boxes here at Bill Baber Knitwear, buy them in from IKEA and you’ll find endless ways to use them. We use use Post It notes & sheets of scrap paper – the brighter colours the better. We collected paper or card packaging material and repurpose it wherever we can. And some thick marker pens, lots of colours are best. We love a Sharpie marker! We start out by creating colour maps for each of our base colours. In this case we are using Black as a foundation, or base colour, here there are four variants Pine, Charcoal, Ivory and Jewel. We put up a colour map for each of our base colours (e.g. Pink, Black, Khaki, Maroon), each base group could have three of four colourways, so its a huge collection to start with. We start collecting up our base colours from the assorted yarn stocks we use, here you can see Silk, Merino Wool, Cashmere, Donegal Wool and a new Wool & Silk mix called Iona we are testing out. The Post It notes show us gaps in our colour range that we may wish to fill. There are lots of base colours to work with and as yarn suppliers are forever launching new colours or discontinuing old ones, we are often finding new gaps to fill which leads to exciting new colourways. Yarn suppliers produce shade cards for their available colours, some do it every few months, others maybe once per year. In some rare cases we may have the yarn supplier produce a specific colour to order for us, although its a very costly and time consuming practice so we enter into it very carefully. Below you can see a selection of shade cards lined up on Porche, one of our knitting machines. These cards show a range of Cashmere we use from Todd & Duncan and also a small selection of colour wrappings from Gardiners, these are from the new Silk & Wool mix called Iona. Once we have identified the gap in our base colours we can go hunting in these shade cards to find the missing colours – this often takes days as we find new colours we love and that might start a whole new collection! It is good fun. Once we have the base colours all together, we put each one into a box. It makes it much easier for us to fish out the right cones as we are sampling – uses up a lot of boxes as you can see, but really helps to be organised before we start. Each box contains each of the different yarn types we use as base colours. So in Black you’ll find a Cashmere, a Silk, a Merino Wool, a Donegal Wool, a Linen and a new Iona (that’s the wool/silk mix in case you haven’t been paying attention). We also start a box for each colourway. So using Black as a start, we have a box each for Pine, Ivory, Jewel and Charcoal. We then write ourselves a little instruction list on how to build the colourway and affix that to the box. Each Colourway is actually available in a range of yarn mixtures, at present we are working on eight for launch through 2019. There is a Silk & Linen 2 colour, 3 colour and a 4 colour swatch. Then we have a Merino Wool & Linen and a Donegal Wool & Linen swatch that we use to make our Celtic Stoles. You also have the new Iona & Linen swatches, these haven’t made it into any garments yet as we are only trialling the yarn so far. And finally there is a 100% Cashmere and a Cashmere & Silk mix. There are an lot of colours! For each Base Colour, we have maybe three of four Colourways and for each Colourway you have up to eight Swatches. we are going to need a lot of boxes! We hope that was interesting. 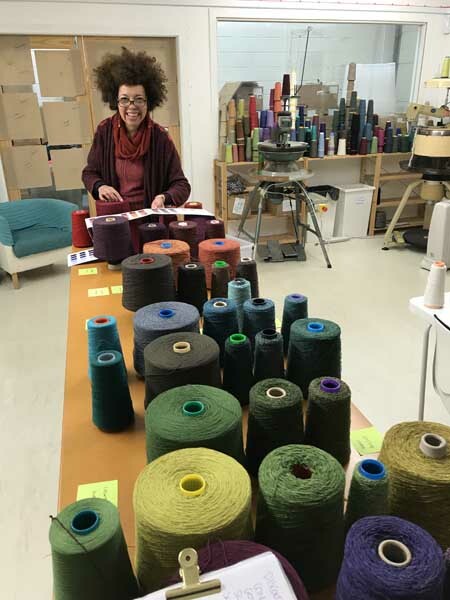 Creating new colours is one of the most fun jobs we have here and we spend a lot of time in the Winter getting ready for the new year collections. Keep an eye online for the new colours as they launch. You’ll see new collections online through 2019 and we will be showcasing new colourways through our social media all year. If you aren’t already on our newsletter mailing list then please sign up so you don’t miss out on the news as it happens.